A team of engineering students from the University of New South Wales (UNSW) has been crowned champions in the main football event at the RoboCup games in China. The competition, which was established in 1997, sees teams programming robots to battle it out on the football field. This year’s edition saw over 300 teams from 47 countries participate across multiple categories, ranging from humanoid robots of various sizes to robots on wheels with mechanisms for passing and shooting. The main competition involves teams running their own code on a standard 58 cm-tall robot. As soon as each game kicks off, the robots are effectively autonomous, with the teams not allowed to input via remote control or by adjusting the programming. “They tell everyone else where they are on the field and where the ball is, and they make decisions,” said Sean Harris from the UNSW team. 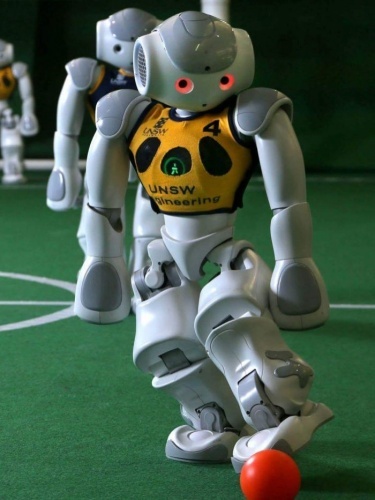 In this year’s final, UNSW Australia defeated B-Human, a German team from the University of Bremen and DFKI (German Research Centre for Artificial Intelligence) by three goals to one, defending the title they had won in 2014. The 2016 RoboCup is set to take place in Leipzig, Germany.